Why may the shale gas promised by the US to Europe be non-competitive? Brussels' hopes on the production of shale gas in Europe as a new alternative source to meet growing needs in energy are weakening before our eyes. Attempts to extend the US shale boom in Europe do fail, demonstrating fiasco of the Washington's intentions to make Central and South East Europe independent of Russian energy. The Wall Street Journal wrote back in March that Chevron, Exxon Mobil and Shell almost completely stopped exploratory drilling for hydraulic fracking in Europe. Chevron stopped its last European fracking operations in Romania in February. Shell reduced world-wide shale spending by 30% in a number of countries including Turkey, Ukraine and Argentina. Exxon withdrew out of Poland and Hungary, and suspended its German fracking operations. However, the EU continues to hope, if not for development of shale gas production in Europe, then at least for imports of shale gas from the US in the form of LNG. These high expectations are inspired by the impressive performance of the US shale gas industry. 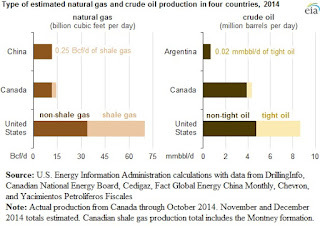 According to the U.S. Energy Information Administration (EIA), presented in the chart above, currently only four countries in the world - the US, Canada, China and Argentina - have driven the development of shale deposits up to commercial production levels. The absolute leader in the production of shale gas is the United States. According to Reuters, the total U.S. gas production has increased by 43 percent from 51.9 billion cubic feet per day (bcfd) in 2005 to a record 74.4 bcfd in 2014. The EIA expects gas output to reach 78.4 bcfd in 2015 and 80.0 in 2016. These optimistic estimates diverge from the views of many experts, who assert that further growth in shale gas production is possible only in case of a stable oil prices rise on the global market. In reality, however, U.S. crude futures CLc1 (Crude Oil Front Month Futures) decreased by 46 % from the level of more than 107 USD in June 2014 down to USD 58 at the end of May 2015. If such a trend continues further, experts expect that it will hinder the natural gas production growth. This is indicated by the Genscape Inc. data, which predicted a reduction of daily production of shale gas by 1.1 bcfd in the US next year. Bank of America Merrill Lynch also expects the decline in production of natural gas in 2016 in the US. According to the Bank's forecasts, the reduction will amount to 1.3 bcfd by slowing down the production of shale gas from deposits in Marcellus and Utica under the influence of falling LNG prices by 50%, which in turn are linked to oil prices. It is obvious that the expected reduction in the production of shale gas will not be conducive to the development of its exports from the United States. At the same time, the predicted trend in the production of shale gas in the US is not the only problem in the pursuit of shale LNG supplies to Europe. Another problem is the low quality of shale LNG from the US, which calls into question its competitiveness. Japanese importers highlight in particular the existence of quality problem of shale LNG from the United States. Their attention and concern regarding this issue is caused by the fact that Japan is going to increase significantly the share of LNG from the US in Japanese imports. Expert opinion in this country is particularly important because Japan is the world's largest importer of LNG. According to a special report of the EIA published in January 2015, Japan's share in global imports of LNG was 31% back in 2010. On March 11, 2011 a tragic earthquake and tsunami hit Japan. The earthquake destroyed all the off-site and almost all the internal power sources in Fukushima-1 nuclear plant. After that terrible disaster LNG demand in the Japanese market has increased significantly, and in 2014 Japan's share in global imports of LNG reached 37%. Historically, Japan was among the first countries to import LNG. The first shipments of LNG from the United States to Japan took place in 1969 from gas fields in Alaska. Meanwhile, since then the share of US LNG in Japanese imports has remained insignificant. According to the BP Statistical Review of World Energy 2014, the largest supplier of LNG to Japan in 2013 was Australia (21%) followed by Qatar (18%), Malaysia (17%) and Russia (10%). In recent years Japan, as well as the EU, has looked forward to importing LNG produced from shale deposits in the United States. However the United States is evidently in no hurry to begin LNG exports. It is well known that American exporters had to obtain approvals from the federal Department of Energy to supply gas to countries, which do not have free trade agreements with the United States. Such free trade agreements are in force with 20 countries but there is neither Japan nor the EU among them. The new legislation should simplify the permitting procedure but its adoption is still pending. More importantly, the prospects of shale LNG supplies to Japan from the US are overshadowed by the fact that the American LNG is of inferior quality, especially heating content, which does not meet the market requirements. The report of the Institute for Energy Economics in Japan indicated that “LNG from the United States will be leaner than LNG from traditional producers in the Asia-Pacific region with lower heating content, lighter in gravity, less ethane and propane, and mostly comprising of methane. While a vast majority of Japan's city gas has a standard heating value of 45-46 MJ /(m3), natural gas distributed in the US has only 37.3-40.1 MJ/(m3) on average”. Japanese experts also argue that low characteristics of the US LNG quality besides the weak competitiveness may cause logistical problems associated with its storage and distribution to consumers. As a matter of fact it will require after regasification to mix the leaner LNG from the US with the richer one delivered by other countries or to create a separate capacity for storage and distribution. Such a pessimistic scenario of LNG supplies from the US to Japan obviously has to be very symbolic for the EU, where the same problems should be expected. This is actually important taking into account that in spring the European Commission launched an EU Energy Union to bind the 28 countries into a single energy market aimed at tightening competition. How in case of the newly formed single EU energy market can the politicians in Brussels count on the successful market positioning of shale LNG from the US, less quality, but more expensive considering the cost of shipping across the Atlantic? Why should European consumers have to pay for these not economically, but clearly politically-motivated plans recklessly focused on replacing Russian gas with the shale LNG from the US having a lower quality to price ratio than its competitors? What was the Concert of Europe?